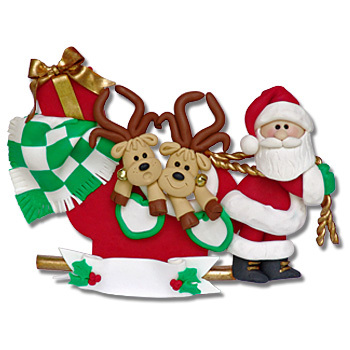 Personalized Ornaments - All orders are personalized FREE! Ho-Ho-Ho! The reindeer have paid their dues and now it's Santa's turn to pull the sleigh. This personalized ornament is great for grandparents, a couple or even pets. May be personalized with 2 names on the hearts and a message on the banner such as "Grandma's Dears". Each and every ornament is designed by Debi Allison and all of our personalized ornaments are exquisitely handcrafted and detailed from polymer clay. Absolutely no molds are used! Comes complete with a hook and satin ribbon for hanging. Measures approximately 4½" x 6"
Your shopping cart is currently empty. Please click on a category to begin shopping. Subscribe to our mailing list for upcoming events and sales!